On June 7, 1930, a tugboat chugging through a drainage canal outside of Chicago churned up a body that had been weighted down with seventy-five pounds of iron. Inside the dead man’s suit was a photo of pretty girl with the inscription, “Gene, I’ll be loving you always, Maria.” Could Maria have been Mary Collins? According to one writer; yes. As the body sat on the slab waiting for identification, somebody called Tom McLaughlin, the president of the Checker Cab Company, and asked him if his younger brother, Eugene “Red” McLaughlin—the very same gangster who was arrested for the murder of victim number two, Irv Schlig— was missing. Tom said that Red hadn’t been seen in two weeks. The caller then told him about what the police dragged out of the drainage canal and Tom raced over to the morgue. There he officially identified the corpse as his younger brother. Shown the photo Tom reportedly said, “Yes, that’s Mary all right. I told him she was poison and he would get his, if he went around with that skirt.” Apparently Red laughed off the curse, not realizing he was victim number six. The seventh and final gangster to succumb to the Kiss of Death girl was Sam Katz, an extortionist who specialized in kidnapping gamblers and holding them for ransom. One day, Katz and Mary were picked up and taken in for questioning. In regards to the Kiss of Death curse, one of the detectives told Mary, “Why don’t you quit this bird. Give him a break—Let him alone.” Both the Kiss of Death girl and Katz laughed it off. 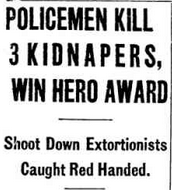 Two months later on July 16, 1932, Katz and two accomplices showed up to a gambler's office to shake him down. The trio had already kidnapped his brother once, and they threatened to kidnap him if he didn’t come up with a payoff. The gambler called the police and a trap was set. When the gangsters showed up to collect their loot, the gambler gave them a hundred bucks. They told him to go get more, so he left his office and the police ran in. The gangsters were told to put up their hands but Katz went for his gun and received a fatal blast from a shotgun for doing so. His confederates too, were killed.